All the coffee in the world is grown in one region of the world, which has been nicknamed the Bean Belt. The coffee belt contains the regions that have the right conditions needed for growing coffee: a lot of sunshine and warmth. This area is located around the Equator, between the Tropics of Cancer and Capricorn. In the United States, Hawaii is the only state that has the right conditions to produce commercial coffee. Coffee comes from a tree. While the name coffee bean might be a little misleading, coffee comes from the pit of a berry, technically making them seeds. They are referred to as beans because of their resemblance to other beans. Despite what you might think, drinking coffee has a lot of health benefits, and it can even help you burn fat. Few chemicals can help with fat burning, but it has been shown that drinking coffee can increase your metabolism somewhere between 3 to 11%. Just behind oil, coffee is the second most traded commodity on the planet. Over 25 million farmers in over 50 countries are involved in producing the coffee you drink every day. Generally, there are two main types of coffee beans: Arabica and Robusta. Arabica accounts for 70% of all coffee and is the most consumed. Robusta has a much more bitter taste and is generally found in higher quality grounds. Robusta also has a much higher caffeine content. Almost half, 40%, of the world’s coffee comes from Brazil. That is twice as much as both the 2nd and 3rd place countries that produce coffee. If you were wondering, those would be Colombia and Vietnam, respectively. Coffee can kill you if you drink enough of it. But, don’t worry, you would need to drink over 100 cups of coffee to consume the lethal dose of caffeine. And those 100 cups would have to be consumed in a very short amount of time. So, while it’s possible to overdose on coffee, you probably don’t have to worry. New Yorkers love their coffee. They drink more coffee than anywhere else in the United States. But that doesn’t hold a candle to Finland, which is the most caffeinated country in the world. The average adult in Finland consumes around 4-5 cups of coffee every day. Fun fact: coffee with creamer added to it cools around 20% slower than black coffee. But when you add milk, you are decreasing the effects of caffeine, because our bodies absorb milk slower, which decreases the stimulants as you drink. It has been reported that you might not even need to drink a cup of coffee to get the perks. Studies found that simply inhaling the aroma of coffee can sometimes alter brain activity, reducing the effects of sleep deprivation. Sorry to all the decaf lovers, but, honestly, there isn’t such a thing as decaffeinated coffee. 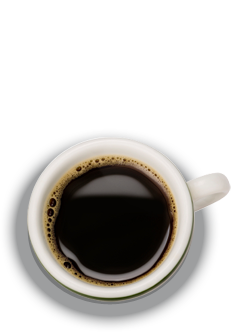 A cup of decaf coffee generally has somewhere around 2 to 12 milligrams of caffeine in it. So, technically, it does have caffeine. But, when you compare it to the 95 to 200 milligrams of caffeine that is found in regular coffee, the caffeine in decaf is rather small. Even a 12-ounce coke only has around 25 milligrams of caffeine. The United States is quickly becoming one of the leading consumers of coffee in the world. Americans consume around 400 million cups of coffee every day, or around 146 billion cups a year.